You have to add the URL address of your site that contains the card (e.g. 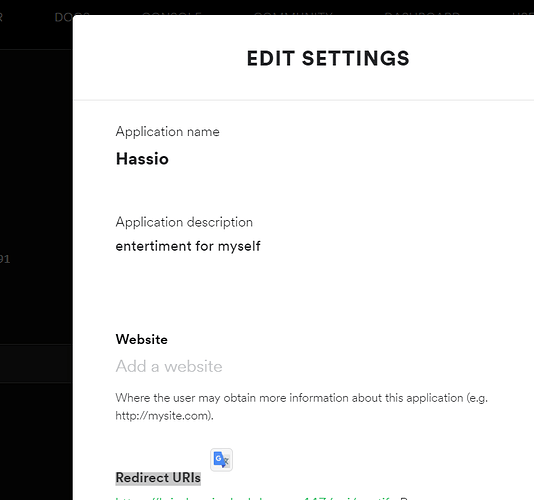 https://blablablahassio.duckdns.org/lovelace/3) to your developers.spotify.com-> my dashboard-> edit settings->rediect URLs. @dkramer74 choosing a mediaplayer can only be done with online mediaplayers. Try starting spotify on a device or use the web player (https://open.spotify.com) and load the card. Now these player(s) will appear. The device list on the player is using the Spotify connect api and because opening spotify on a chromecast device requires authentication I can’t initiate a chromecast playback I’m afraid. Really love this custom card, gives so much extra function, so many thanks for it Great work. A minor question, I need to re-authenticate a few times per day via the card, is there any possibility to make it more permanent or it is something that handled on backend side? I will fix the reauthorization bug as soon as I have time. I think it is fixed by trying to auth with the old token even if the old token is expired but I need to investigate further. Thanks for your help. Let me know if you need a helpful hand to test it. Does it work with custom_updater? Unfortunately it doesn’t work with custom updater for me. Do you know how I can add support for it? Also I moved the repo to custom-cards yesterday and haven’t had time to update. Sorry but I don’t know but I’ll try it with the new URL. As I see the updater gets data from the “custom_components.json” (or similar) at the others. I read up on the code and docs for custom_updater https://github.com/custom-components/custom_updater/wiki/How-it-works and it seems it works only with downloaded cards. I would say that adding the URL resource is far superior and you if you choose the master url (the one I pasted) you will always get the latest card. so should I to add this URL for the Custom updater component in the configuration? I mean I had to download it manually. The custom updater can’t find it now.